One of the latest smartphones that Chinese mobile phone maker ZTE has made available for purchase in its homeland market is the V965, currently listed at various retailers with a price tag starting at only 1,099 Yuan ($177 / €138). The handset arrives on the market with a 4.5-inch touchscreen display capable of an 854 x 480 resolution, while being powered by a 1.2GHz quad-core MediaTek MT6589 processor, paired with 512MB of RAM. Additionally, the new mobile phone sports 4GB of internal memory, and packs a 5-megapixel photo snapper on the back, as well as a 2MP camera on the front, great for making video calls. The phone’s specs list also includes a 2000 mAh battery, as well as Google’s Android 4.1 Jelly Bean operating system loaded on top. 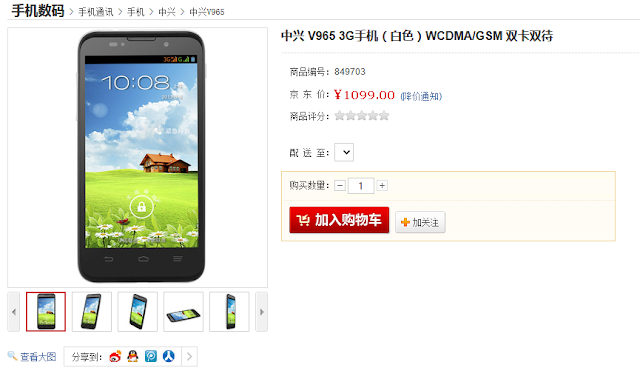 As GSMInsider notes, the handset can be seen listed at TMall and JD.com.